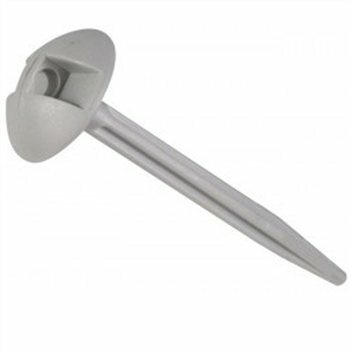 Ideal to secure all types of tent groundsheets with eyelets, these plastic groundsheet pegs are highly visible to prevent loss and accidents that involve tripping over. Sold separately, the basic design of these groundsheet tent pegs include small ridges to grip the pegs better when in the ground, while the large circular tip helps to hold the groundsheet in place. The Kampa plastic groundsheet peg will also pull from the ground easily, making the groundsheet peg better than tent pegs for securing groundsheets as the peg will simply be pulled from the ground if tripped over, rather than the risk of tearing the groundsheet.